Over on Brian Burke's Advanced NFL Stats site, you can see the live win probability for the Eagles-Cardinals game. Right at the end of the half, the Eagles were already down 17-0, and things weren't looking great. But with their final drive, they had a chance to tighten the score before halftime. A touchdown, narrowing the lead to 10, would have been positive — raising the team's win probability to 20 percent (and with this explosive offense, that might be a low estimate). Of course, we know that didn't happen. Instead, the Eagles tried three times to stick the ball in the end zone, only to give up a 95-yard fumble return for a touchdown instead. That self-destructive 14 point swing cost the Eagles any chance they had of getting back into the game (probability: four percent). So what was the problem? Michael Vick deserves some of the blame. If you replace him with Aaron Rodgers or Tom Brady or Drew Brees, the Eagles probably score. But that's unfair. The play calling also wasn't perfect, but that wasn't the main issue either. The real culprit was the Eagles lack of red zone weapons. With only dwindling seconds to work with and no timeouts, the offense had to take their most effective option — the run — off the table. 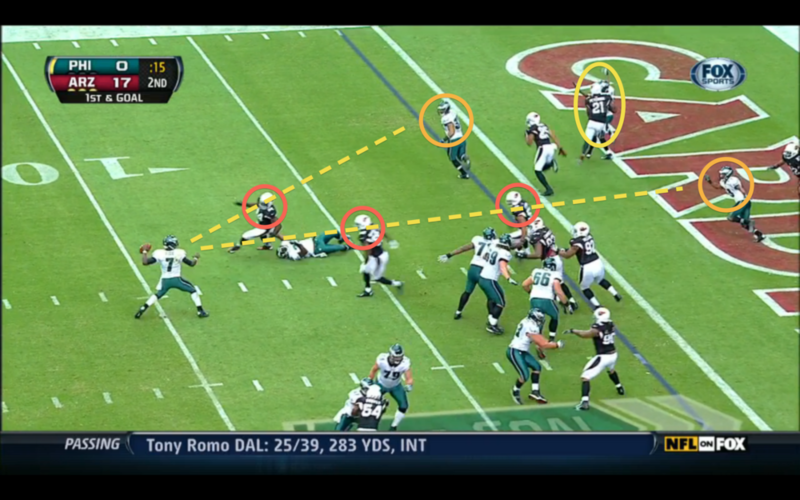 Everyone knew Vick had to throw, and the Eagles couldn't out-execute the Cardinals in the face of that knowledge. Let me show you what I mean. Below is the first down play. Even though running is impossible, they line-up in the I-Formation to fake it. Vick's three receiving options are fullback Stanley Havili and two tiny wide receivers — Damaris Johnson and DeSean Jackson. Not exactly murderer's row. Here are the routes pre-snap. Here's what Vick sees when he first drops back. Not much there. With DeSean covered, it's Havili or Johnson. Havili looks open, but he's not in the end zone. If he gets tackled outside, you lose your shot. Inside, Johnson has broken free of his man, but there are multiple defenders in between him and Vick. Does he want to risk that pass? Vick almost throws to Johnson, pump-fakes instead. Again, he had two options, but there were defenders in the way (and in his face). A perfect throw gets this done, but Vick is hesitant — and with two more chances, why risk it? The defender in red probably would have gotten any pass to Johnson. Vick throws it away. Alright, let's move on to second down. You're going to see many of the same problems. Here's the pre-snap alignment. Jason Avant and Clay Harbor at the top. DeSean below. Everybody is covered man-to-man, pressure coming up the middle. Vick's best option is Harbor breaking free, but he can't actually see him. A better quarterback lofts a ball to Harbor. Vick throws it away before taking another hit. Finally, the ill-fated third down. Again, the Cardinals are going to bring pressure. They leave nearly all the receivers in man coverage. McCoy decides to block the rusher at bottom. Celek tangled with McCoy's blitzer, so Rhodes is coming free on the other side. Again, Vick has nowhere to go with the ball. He's sacked so quickly. Other than anticipate Harbor getting free on second down, I see little to fault Vick on here. The Cardinals knew passing was the Eagles' only option, and they didn't feel threatened by any of the receivers. Everyone received basic man coverage except for DeSean Jackson on the final play. Where was Vick supposed to go with it? And certainly Rhodes coming that free off the edge wasn't his fault — if anyone's it was McCoy. I said on Twitter yesterday that this game reminded me of one of those "McNabb without weapons" classics. This is what I mean. Without Jeremy Maclin, the Eagles had no receiver whom they could count on to beat man coverage and get open for Vick in the end zone. So you had three straight tries, and a horrible, predictable result. Tagged with Arizona Cardinals, Jeremy Maclin, Clay Harbor, NFL, Philadelphia Eagles, Damaris Johnson, Jason Avant, Week Three, Red Zone, DeSean Jackson, LeSean McCoy, Michael Vick. September 24, 2012 by Brian Solomon.